Though all but one of the original Wonders of the World no longer stand, we are still fortunate enough to have all of the Wonders of the Swimming World. While some of these locations may not be the newest, the largest or the prettiest, they all have something in common: culture. Be it surviving a World War, or complementing a beach town, these locations have greatly influenced the shape of swimming as we see it now. Stadio Olimpico del Nuoto in Rome, Italy makes the list due to its unique architecture. Built during the rule of Mussolini, the entire complex looks like something out of ancient Rome. The location was host to the 1960 Olympics, and after reconstruction, was also host to the World Championships in both 1994 and 2009. Colorful images line the indoor pool, providing swimmers something pleasant to look at as they warm down. A wonder more recently constructed, the Water Cube (Beijing National Aquatics Center), is an incredibly unique cuboid covered in bubbles. Home of the 2008 Olympics, the Cube saw over 25 world records, with many iconic swims that won’t soon be forgotten. Remodeled in 2010, the Cube now serves as a water park for the public, and stands as a shrine to one of the most remarkable Summer Olympics of all time. This pool makes the list for its tremendous history. From Mark Spitz’ seven individual gold medals to every Olympic swimming event record falling at the 1972 Summer Olympics, Olympia Schwimmhalle has seen it all. The pool was part of West Germany’s attempt at showing the world its new, cheerful democracy (the Games’ motto was the “the Happy Games”). 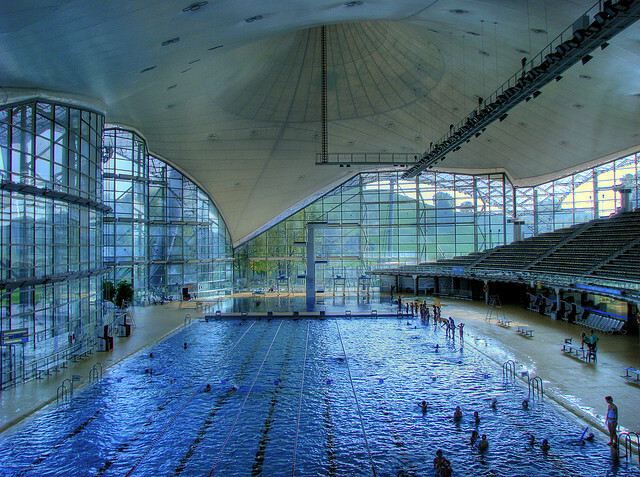 Despite the tragedy of the “Munich massacre” that occurred during the games, Olympia Schwimmhalle still stands as an important piece of history for the sport of swimming. I’ve never been to the Pyramids, but I think the ISHOF is a suitable replacement. The International Swimming Hall of Fame, located in Fort Lauderdale, is an incredible complex, paramount amongst all other hall of fames. Complete with a museum, a 50-meter pool and a diving well, ISHOF was home to the (then) YMCA Short Course Nationals, beginning in 1971. The meet was the largest swimming championship in the world for a brief time in 1975. The amount of history at this location is incalculable, as thousands of swimmers have come through this venue to view both live competition as well as the trophies, old swimwear and medals that line the inside of the museum. Though the facility has not aged well, and a new pool is in the works, with construction beginning later this fall. The Piscine Georges-Vallerey sits in Paris, France, near the Porte de Lilas, a historical landmark that once served as a gate in the Thiers Wall. Named after the French swimmer Georges Vallerey, a hero during World War Two, the pool has undergone significant changes since it’s construction, including the installation of a retractable roof. The pool hosted the 1924 Olympics, which also saw the first appearance of lane lines in competitive swimming, a major upgrade from the 1900 Olympics, in which swimmers raced in the Seine River. This wonder probably needs to have an asterisk next to its name, as it is only a pool every once in a blue moon. Nonetheless, it is an impressive arena capable of seating 17,000 spectators, and will host the Olympic Trials in 2016. Built for the 1976 Summer Olympics, this pool was a place of firsts. It was the first pool to utilize a 10-lane system, in order to decrease the impact of waves during races. Coinciding with that system, the gutters were designed to prevent waves from bouncing back from the wall. Famous for its yellow catwalks that weave across the ceiling, the pool is still the location for Canada’s Olympic Trials.